1. To ensure the best performance and protect the inside circuit board, the shell will get warm up to 52℃ because the high quality aluminum alloy speeds up heat conduction. 2. Support PD 3.0 charging at max 20V 3A, this Type-C pass-through female port can quickly charge new Macbook or other USB-C devices based on PD charging protocol for power supply. Note: USB C female port is only designed for charging, NOT for data transferring. Please use power adapter(not included) under 87W. 3. NO TYPE C PORT is available to charge your device. 1 * USB C Male:Compatible with thunderbolt 3. 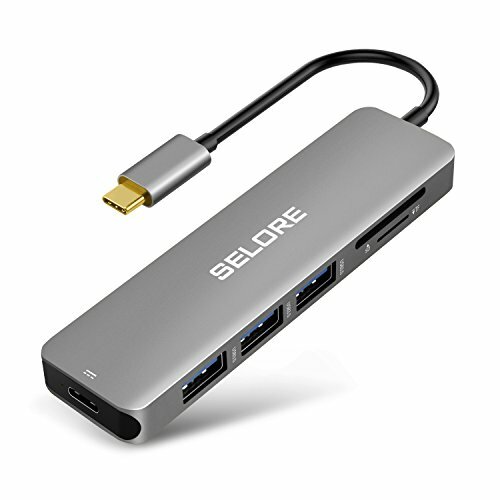 Make Sure that the host USB-C port on your device complies with the USB3.0/USB3.1 specification. √Instant Expansion with 6 Ports: 3 USB 3.0 port, a USB-C female charging port,a SD card slot and a Micro SD and slot. √Compact & Compatibility: Design for easy-to-use; Just plug and play.No additional installation or software necessary. Compatible with all new MacBook, DELL XPS15, HP Spectre X360, Chromebook, Samsung Tablet, Huawei Matebook. √Worry Free Purchase:No need to worry if there's something wrong with the products because we offers a 12-month guarantee warranty of a full refund or replacement. If you have any questions about this product by Selore, contact us by completing and submitting the form below. If you are looking for a specif part number, please include it with your message.